Home Uncategorized THIS OLD VAN makes a pit stop…. 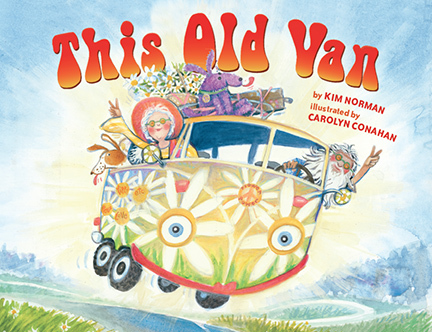 Kim Norman’s latest picture book is the oh-so-groovy This Old Van (Sterling, August 4). Kim is one of the members in my critique group, the PBJeebies, and, let me tell you, there is so much to love about this book. It’s a real deal story based on a catchy and familiar tune. It involves a variety of vehicles. It’s genius. Kim was kind enough to agree to an interview. Kim, tell us about This Old Van. Thanks, Tammi! It’s a rollicking ride in a click-clack-rattle-rack van piloted by a pair of happy hippy grandparents. On their way to a grandchild’s special event, they pass friendly vehicles like three tractors, four semi-trailers, ten dirt bikes, etc., so–like “This Old Man,” the song from which I took inspiration–it’s a counting book with a groovy twist. This is another book, like If It’s Snowy and You Know It, Clap Your Paws!, that’s based on a song that was a favorite in our house when my boys were little. I have video of my younger son, not quite two, encased in a body cast, singing “If You’re Happy and You Know It,” but his real most favoritest-favorite was “This Old Man,” which my husband or I sang to him every night in a rocking chair. I confess, I wasn’t as vigilant as my husband, who dutifully sang all ten verses. I’d skip a few numbers and hope to get away with it. As you mentioned, I’ve had some success with re-casting songs into children’s books, so this particular, beloved tune was ripe for a re-telling. You are a master at using a familiar tune and retooling it into a fun and fresh story. Not only have you used this approach for This Old Van and If It’s Snowy and You Know It, Clap Your Paws!, but you’ve used it for Ten on the Sled as well. What’s your secret? My dad was a huge punster, so some of my retellings start with a bit of a pun, simply turning a word in a song title, which gets the ideas popping. I remember I was sitting at my computer years ago, twisting titles that way, when the title Ten on the Sled popped into my head. I immediately thought, “Oooo. That’s good!” I dropped whatever I was doing and started writing the manuscript. Casting the story was fun because I got to research the sort of animals one would find in the arctic who might be riding on this crowded sled. This Old Van is a similar title-twisting pun. Even though my parents weren’t hippies, it reminded me of the clunky VW bus that transported my family during the real hippy era, particularly around Guantanamo (Gitmo) naval base in Cuba. It’s a fond memory for me, but apparently my dad didn’t love it as much as we kids did. He used to threaten he was going to drive it into the bay before we returned home. He sold it on base before we returned stateside, so – who knows – Cuba is so famous for its pristine antique cars, maybe that old van is still tootling along the streets of Havana. Did you face any particular challenges while writing this book? Well, since you are responsible for some of my challenges, you ought to know the answer to that question, Tammi Sauer. LOL! One thing you caught, which needed fixing, was the fact that there were no real stakes if the hippy grandparents didn’t get to their destination by a certain time. So when I rhymed “late” with “eight,” (“now they’re running late!”) you called me on it, asking “What are they running late FOR?” I hadn’t established any particular “ticking clock” tension; they were simply on their way to visit a grandchild. After you pointed out the problem (lack of tension), I think we all brainstormed and came up with an opening scene where it’s clear they are leaving for the grandchild’s special event (not revealed until the end of the story) so they mustn’t be late. I can’t take credit for thinking of the brilliantly perfect event to which they’re traveling. That’s all thanks to illustrator Carolyn Conahan and her art director. I also made a lot of extra work for myself when I decided that, instead of an unchanging refrain, I wanted to repeat the number again in each refrain. With this new revision, each refrain ended with, “This old van says ‘goodbye one!’” (or two or seven, whatever the number for that spread.) The trouble with making that change was, now, instead of rhyming a number only once per stanza, I had to rhyme it TWICE: once in the verse and once in the refrain that follows each stanza. Do you KNOW how few words rhyme with seven?! I believe going that extra mile, even when it feels like extra work, is what makes a manuscript really stand out, so when I write in rhyme, I allow myself the more obvious and simple rhymes on the first draft, but after that, I try to dig deeper, choosing more unexpected words for the rhymes… AND (perhaps even more importantly) I don’t concentrate only on the end rhymes. I watched a wonderful rhyme workshop hosted by Kidlit411 during which Renee LaTulippe offered this advice: “Don’t just save the good stuff for the rhyme.” Yes yes yes! All rhyme writers should tattoo that onto both wrists! Because a rhyming children’s book isn’t just about the rhymes. It’s about surprising wordplay and pacing and humor and plot and all the other elements that go into any great children’s book. Please give us a glimpse of your workspace. 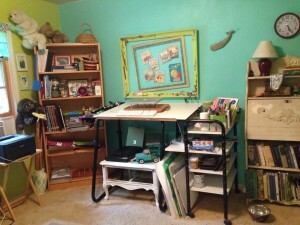 This is my combined art room & office. I don’t illustrate my own books (so far!) but I like to unwind with the occasional art project. I usually stand at the drafting table and write – better for me than all those years I sat on my growing bottom at a newspaper office. Now and then, I grab thrift store stuffed animals that look like the characters in my books. The little gorilla is the newest, for my book, Still a Gorilla, coming out from Orchard next year. The frames encircle some beloved Little Golden Books that I read to my sons when they were little. Sometimes my dogs tumble around my feet while I’m trying to write so – I’m not kidding! – I went out and bought a little plastic wading pool that I stand in while I work. (No water, of course.) The dogs tumble AROUND the pool, but not in it, which saves me a few bruises. Lower left, you see their silver water. Shhh! Don’t tell the writers’ conference that awarded me the bowl. But honestly, I can’t think of a better use for a silver bowl. Why let it just sit, unused, gathering dust? Kim, I know you’ve had a ton of success with school visits. Tell us about your new site called coolschoolvisits.com. It’s my first WordPress site, so I’m still learning how to do things on the blog, but I’m having a great time, sharing the things I’ve learned over ten years of doing school visits. I wish there had been a resource like that when I was getting started. A lot of my author friends say the same. We all just stumbled around, making it up as we went along. Many subscribers to the blog are also experienced presenters, so they have generously shared their advice and experiences, too. It’s becoming a lovely community. What are your top three pieces of advice when it comes to school visits. Keep all of your correspondence! As soon as I reply to an email, even if it’s just in reply to an inquiry (not a solidly booked visit yet) I still save my reply and the original email, so I’ll remember what we discussed. I’m not the world’s most organized person, but developing the habit of keeping every email (or taking careful notes, if the communication is via phone) has saved me a lot of time and worry. Another great time-saver was when I wrote up a thorough document that explains about my school visits: how much I charge, how to hold a book sale, etc. It was such a relief, after it was written, to just attach that to my reply when someone inquired about a school visit. Before I had that document, I spent a lot of time writing long emails, explaining over and over again, all of the details about my visits. When you’re doing the presentation, concentrate on the KIDS. Sure, you can throw in rare moments of humor to entertain the teachers, but keep 98% of your focus on the students. 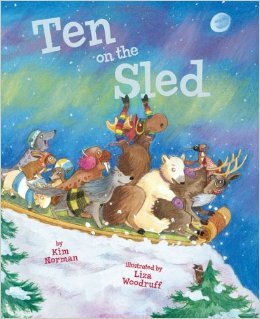 Also in the works is a “three-quel” to Ten on the Sled, called She’ll be Coming Up the Mountain When She Comes, published by Sterling and again illustrated by Liza Woodruff. Another upcoming Sterling title is The Bot that Scott Built, illustrated by Agnese Baruzzi, about a robot that causes havoc at a school science fair. I’m equally excited to have recently announced my first sale to Candlewick Press. It’s a rhyming picture book called Give Me Back My Bones. Really looking forward to working with the editor on that manuscript! Many thanks for joining us at Picture Book Builders. Kim was kind enough to offer a signed copy of This Old Van for one of our readers. Race to the end of this post and leave a comment to be in the running. The winner will be revealed in September. 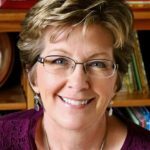 Kim Norman is the author of more than a dozen children’s books published by Sterling, Scholastic and two Penguin imprints. Ten on the Sled, (Sterling, illustrated by Liza Woodruff) spent weeks on Barnes and Noble’s Top Ten bestseller list and has been released in Korean and German editions as well as appearing in Scholastic Book Fairs in schools around North America. Among her books is I Know a Wee Piggy (2012, Dial Books for Young Readers, illustrated by Henry Cole), which was reviewed in the New York Times, and is listed on the Texas “2×2 Reading List,” as well being offered on the lineup of books carried by Dolly Parton’s Imagination Library. Her most recent title is This Old Van, published by Sterling Children’s Books, and illustrated by Carolyn Conahan. 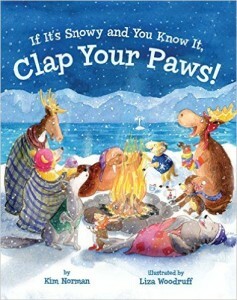 A sequel to Ten on the Sled, entitled If It’s Snowy and You Know It, Clap Your Paws, has been nominated for Tennessee’s Volunteer State Book Award (Primary Division.) 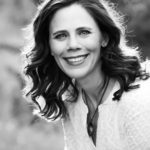 Kim is represented by the Andrea Brown Literary Agency in San Diego. Agnese Baruzzi, Carolyn Conahan, Henry Cole, Kim Norman, Liza Woodruff, Tammi Sauer, This Old Van. Bookmark. I can’t wait to read Kim’s books. Clever! She has such a gift with this approach! Sometimes I worry I’ll run out… but then, after a while, the “well,” seems to refill. I guess we’re all like that, don’t you think? Good thing there’s a silver water bowl nearby, Kim, because you’re on fire! Ha! Thanks, Jill. Just don’t tell the folks who awarded me the bowl. LOL! Looks groovy! It’s on my list! I love your adaptations. Looking forward to reading your newest books. You are on a roll. Keep it up! I am crazy about THIS OLD VAN. Thank you, Sheryl! I may be running out of public domain ideas to “filch.” Time to start writing more original stuff the way Tammi does! I love Kim’s take off on tried-and-true old classics! What a great interview!! She has an amazing way of spinning a classic into something fresh. Thank you, Kate! Tammi asks great questions. I hope you like it, Katrina! Looks like a fun new book. Kim, loved your comment about school visits and concentrating on the kiddos. Thanks for checking out the interview, Kathy! Thanks, Judy. Are you a former hippie? I guess we all are, at heart. Great interview from two of my favorite PB people! Thanks for the behind the scenes on VAN. Looks fantastic! 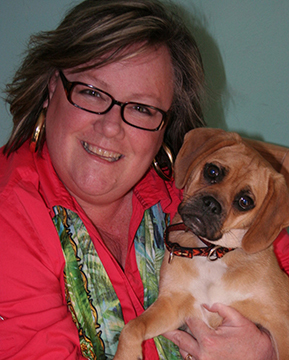 Your office is charming (so is that puggle!!). Aw, thanks! He’s a real heart-stealer! Love, love, love twists on old favorites! Thanks for the very enjoyable post. You’re welcome, Kristi. Thanks for stopping by! This looks TOTALLY groovy! Gotta get my hands on it – and WHAT a fun post! Thanks, Joanne. You sound like a person who totally gets that artistic groovy lifestyle! Looking forward to reading THIS OLD VAN. I love Kim Norman and her Cool School Visits, on WordPress. 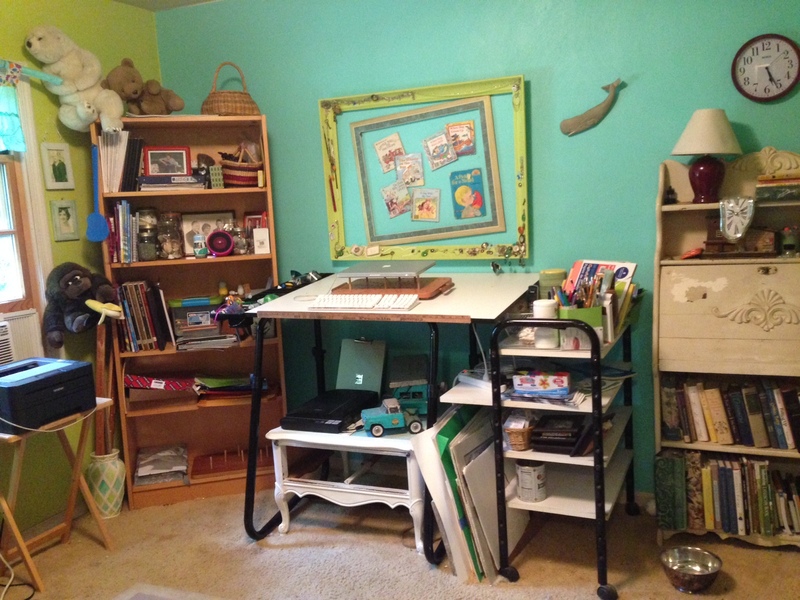 Your workspace looks like it is filled with much inspiration, Kim. I especially like The Golden Books on display and your two sweet doggies. Thank you, Tammi for sharing this interview. Thanks, Kim, for sharing. I love your ideas for developing THIS OLD VAN. I can picture you standing in the wading pool. That is hilarious! You must incorporate lots of humor in your writing. I’m a dog person too, and I totally understand your devoted dogs. Funny thing is, Dorothy, I only realized in the past couple of years what a big dog person I am. I thought I was about even between liking dogs and cats. But I enjoyed Bookie (the puggle) soooo much when we got him last year, that I just had to have another under foot, too. My grown kids (both boys) say I’m trying to replace them. Maybe so! LOL! Great post! Kim has some very clever ideas! I loved Ten on the Sled, will look for If It’s Snowy and You Know It, Clap Your Paws, and can’t wait to see this new one! Thanks, Cindy. If you prefer board books, hang in a bit, because Clap Your Paws is also coming out in board book format… although I confess, I’m not sure if that’s this year or next. I thought the dogs would be in the pool! I think there’s another story there. Thanks for sharing news of your latest book baby, Kim. Thanks for showing us the Van’s journey–will put it on my to-read list! Hope you enjoy it, Buffy! Can’t wait to read it! Thanks for sharing! I can’t wait to read the new book and to check out the school visit website. Thanks for sharing! Thanks, Sandi. I hope you find it helpful. This Old Van should be a fun read! Thanks for sharing more about your process and upcoming books. This Old Van had me at the title! Can’t wait to read it. What a nice thing to say, Kathy! Sounds like you really get it, which is groovy music to my ears. A new author to enjoy–and a rhyming one at that! I’ll be checking out all your books. And your website. Thanks for sharing. Oh how nice, Susan! Thank you! I was not familiar with Kim or her books. Now, I want to go and read them all. Thank you for this great post, Tammi. Oh, you are in for some FUN, Pat. Wow, that’s so flattering! Thank you, Pat. Wow, thank you for introducing me to Kim. I can’t wait to read her books. I’m inspired! Thanks for sharing! I have a nephew who is obsessed with VW vans. Can’t wait to read this book! Oh how perfect! I hope he likes it! Initially did you have a hard time placing a song-based book. I have written one but keep getting hit or miss with it. I’ve had a several professionals review it where some say it’s perfect as it is while others say they love the idea and arc but get rid of the song. Thanks! Ouch, Darshana! I can feel your pain. “Get rid of the song?” Oh man, I can so relate to that kind of confusing, frustrating advice. It may be that the song is just waiting for the right story. I’ll tell you something about a new book I’ve got coming out, a sequel to the sequel to Ten on the Sled. (Tammi calls it a “three-quel.”) Years ago, I listened to my then 3-year-old son singing a mangled version of “She’ll be comin’ round the mountain,” over his baby monitor. He didn’t know I was home from work, so he was watching out the window near his bed, (after a nap) singing, “She’ll be comin’ round the corner when she GITS HERE!” Funny thing is, I thought that song was about MY mother, too. Fast forward 20 years, and I was telling that story to my agent. She suggested I write a story about a child waiting for his mother to pick him up from preschool, to the “tune” of “She’ll be comin.” I took her suggestion, wrote a manuscript we thought was pretty good… and nuthin. We just could not sell that story. My agent felt that only a few years before, in a less competitive market, with so many working moms in publishing houses, the story would have been snapped up quickly. But into the drawer it went. I tweaked it this way and that… tried to make it about a military mom coming one, etc. Still didn’t work. Finally, when I was casting about for a song to use for a Ten on the Sled “three-quel,” I decided to sacrifice the daycare story and use “She’ll be comin” as the backbone of THAT story. It sold quickly and will be out next year as “She’ll be coming UP the mountain when she comes.” So… not sure that’s any help, but it shows that sometimes we have to let things lie for a while until they find a new form. Good luck with your manuscript! Thank you Kim for sharing your story. I really appreciate it! Will definitely file this away for re-reading. Psst! Hey, Darshana. YOU are the winner of THIS OLD VAN. Please send your snail mail address to tksauer at aol dot com. Oh, so clever! And it was fun to hear the work behind the cleverness to make everything just right. Congratulations, Kim! Thanks, Jane. Sometimes I wish I were less of a perfectionist, though. I wouldn’t be pulling out my hair so often. Ha! I am so excited to hear of the forthcoming books… I can’t wait to share “This Old Van” with my kids at school this year! It’s such a fun read aloud! Aw Miss Mel! You are a peach! Congratulations on all of your new announcements and success with the existing books! Coolschoolvisits.com is a great idea! Thanks for sharing! Lived the interview. The workspace was wonderful to see. I find it so interesting what environment inspires different writers. I love clutter and others get the hives in clutter. Thanks for this wonderful posting and great answers. Yes, I’m afraid I’m in the clutter camp, Deborah. Haha! Hey, Tammi and Kim! I love Kim’s books and am very excited to hear about this new one. Thank you both for a fabulous interview! Kim is a master at this approach. Well hey, Linda! Great to see you here! I feel exactly the same about YOUR books! Loved the interview. The workspace was wonderful to see. I find it so interesting what environment inspires different writers. I love clutter and others get the hives in clutter. Thanks for this wonderful posting and great answers. It’s a good thing I don’t get hives in clutter. I’d be in anaphylactic shock right now. LOL! Very clever, to rewrite these classic kids’ songs! And I enjoy your coolschoolvisits blog/site. Congratulations on all your sales and newest release! Thank you, Tina. I hope you find the blog helpful! I’m a new fan of Kim Norman! A review of Puddle Pug, with mentions of all her ‘singing’ books, is going up on my blog. Thanks!! Gotta look for your books. I love the reworking of something you love. Thanks, Linda. I started out writing song parodies for theater cast parties. I guess this is the next step. Sometimes it’s a bit of a compulsion! Thanks, Melissa. Of course, I didn’t swing the camera around and show the mess on the other side of the room. LOL! I’ve been trying to stand more because I gained a lot of weight working at a newspaper for a dozen years, where the only setup was to sit. So bad for me!